RUMOR MILL - DIXON TO RACE IN READING? Larry Dixon fans rejoice! The rumor mill is buzzing with news that he will be driving in Reading behind the wheel of a dragster he's familiar with. Read more about RUMOR MILL - DIXON TO RACE IN READING? RUMOR MILL - THE DOMINO EFFECT FOR THE IHRA? Read more about RUMOR MILL - THE DOMINO EFFECT FOR THE IHRA? RUMOR MILL - THE COWBOYS IN DALLAS? One of the more interesting rumor mill items floating around Charlotte this weekend was Papa John's Pizza has reportedly picked up the two races which were going to be funded by Don Schumacher Racing in St. Louis and Dallas. If what we hear pans out, the golden pizza dragster could have some blue and silver livery Dallas Cowboys style. Read more about RUMOR MILL - THE COWBOYS IN DALLAS? RUMOR MILL - A THIRD KALITTA FUNNY CAR? Word has it the Kalitta Funny Car will expand to a three-car team, and the announcement could come as soon as this weekend. From what we hear, the driver will be a real clutch player. Read more about RUMOR MILL - A THIRD KALITTA FUNNY CAR? RUMOR MILL - LAID BACK HEADERS FOR FUNNY CARS IN JEOPARDY? Read more about RUMOR MILL - LAID BACK HEADERS FOR FUNNY CARS IN JEOPARDY? NEW LOOK FOR THE "SHADOW" DRAG RADIAL? Read more about NEW LOOK FOR THE "SHADOW" DRAG RADIAL? 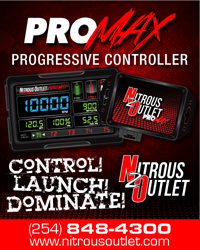 RUMOR MILL - SWITCHING CAMPS IN PRO STOCK? Could a prominent member of Pro Stock's Top 10 be making a switch in teams and horsepower this weekend? That's what the rumor mill is saying. Here's a hint, it's said to be a Camaro. Read more about RUMOR MILL - SWITCHING CAMPS IN PRO STOCK? RUMOR MILL - PRITCHETT RACING IN HOUSTON FOR BVR, ATLANTA FOR DSR? Read more about RUMOR MILL - PRITCHETT RACING IN HOUSTON FOR BVR, ATLANTA FOR DSR? RUMOR MILL - MCCULLOCH REUNITES WITH HUSEN? In what we hear is the first major personnel move since the disbanding of Bob Vandergriff Racing, a source close to the situation tells CompetitionPlus.com that Jason McCulloch will soon reunite with former co-worker Brian Husen on the Brittany Force-driven Moster Energy Top Fuel dragster. Read more about RUMOR MILL - MCCULLOCH REUNITES WITH HUSEN? RUMOR MILL - SPORTSMAN FOUR-WIDE COMING? A source tells CompetitionPlus.com some the Lucas Oil Series classes could run four abreast during qualifying at the NHRA 4-Wide Nationals at zMax Dragway in Charlotte, NC. We are told this experiment will largely be staged with the Super Categories. Read more about RUMOR MILL - SPORTSMAN FOUR-WIDE COMING?